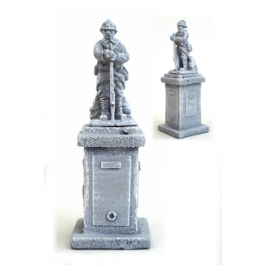 You get a 20mm square by 32mm tall sculpted plinth, each side has plaques sculpted on, very nice work too. To sit on top of this you get a 28mm tall French soldier in WW1 era kit standing to attention. This will stand well in any French town setting. Get an email when new articles or reviews are published.